Whether you’re trying to build an eCommerce website that sells for $1 billion, like Dollar Shave Club, or you’d like to establish a little store that compliments your current WordPress blog, you have an incredible number of plugins to choose from. In fact, some of the best options out there are completely free eCommerce WordPress plugins, cutting down the amount of money you’d have to pay with your startup, yet also delivering a beautiful interface for your customers. We’ve compared the best eCommerce WordPress plugins for building your platform, but some of those are paid, and we’d also like to delve into the world of extensions for those website-building plugins. For example, WooCommerce is opensource, allowing all developers the chance to make improvements with their own plugins. Why wouldn’t you want to take advantage of the multitude of plugins on the market? From full platform plugins like WooCommerce to more simple solutions like a plugin that allows for you to collect paid memberships, the list below displays the best of the best when it comes to functionality and price. Although some of them do have paid plans, the free options are pretty much all you need. 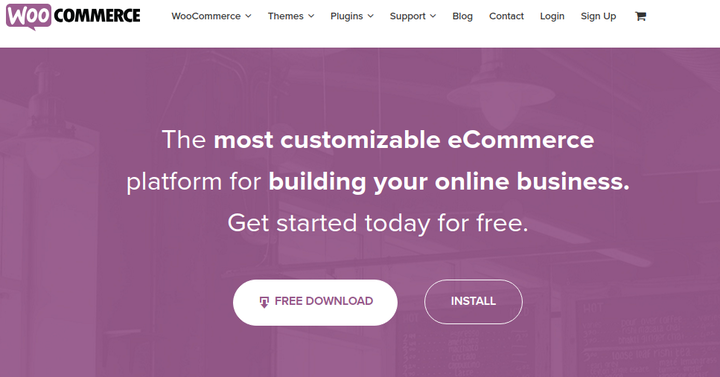 Not only is WooCommerce completely free, but it’s also considered one of the most customizable eCommerce plugins on the market. The developers have made a commitment to developing their own themes and extensions, but you can also find various other extensions from people who like working with the system. What’s more is that you’ll find an onslaught of wonderful WooCommere themes created by third party developers. These gems make the integration process much faster and easier, delivering beautiful displays for your products and shopping cart designs for moving people through your site a little faster. What makes this eCommerce plugin so special? WooCommerce powers over 37% of all online stores, showing that it’s popular and you can scale up with it. The support and documentation is pretty solid for an opensource plugin. A worldwide community is constantly talking about WooCommerce, so you have a person or thread to reach out to if you stumble upon any problems. The interface is mobile-friendly, developer-friendly and simple enough for a beginner to step in and make their own site. Installing the plugin only takes one step, and inserting all of your products and making them look nice only takes a solid theme and some elbow grease. If you haven’t heard of Easy Digital Downloads before, it’s the marquee plugin for selling digital products. For example, if you have an eBook, WordPress theme, audio clip or webinar you’d like to sell, this is the platform you should go with. The best part is that it allows you to make a small store from your existing blog, so you don’t necessarily have to commit to a large eCommerce site. Add-ons are sold for items like email newsletters, payment gateways, recurring payments and frontend submissions. You can also make themes that are made just for Easy Digital Downloads. The shopping cart is clean and simple. Customer management is all done on the backend. Discount codes and payment history is handled on the backend. Data reporting is similar to paid eCommerce platforms you would generally find. 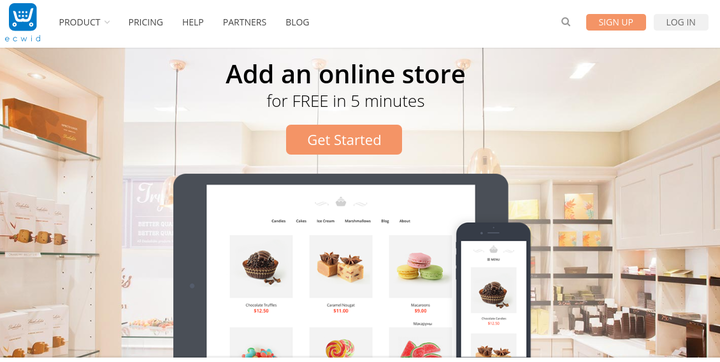 The idea behind Ecwid is that it lets you add an online store to any website, not just WordPress. However, a WordPress plugin is provided to expedite the process. Embedding the store onto your site only takes a quick copy and paste, similar to inserting a YouTube video. What makes this free eCommerce plugin so special? Sell on places like your website, social sites and different marketplaces online. Create a full-fledged store on Facebook. It has a mobile responsive design, so it should pair nicely with your responsive WordPress theme. Ecwid provides the unique feature of giving each customer a mobile app. The simple checkout allows for seamless shopping, anywhere and from any device. A smart shipping calculator is given. Customers can save their favorite products. Jigoshop is a highly rated eCommerce plugin just for WordPress, but it doesn’t exactly have the popularity of WooCommerce. That said, it has similar aspects to WooCommerce. For example, a large extension database is there for you if you’d like to pay a little and upgrade your store. Manage all of your stock from the WordPress dashboard, and receive notifications when some of your stock is low. Receive detailed, real-time reports to learn how to improve your profits. Several different product types are available including digital, physical and grouped products. Most of the settings are configured out of the box, so it really only takes a few minutes to launch your store. MarketPress comes from the folks over at wpmudev, and although it’s not as powerful as WooCommerce or Jigoshop, it has a nice place in the market for simple eCommerce websites. The plugin strives for elegance, so you receive a little product photo, title and Buy Now button, and it integrates with most major payment gateways. All major currencies are supported, and it lets people from all over the world buy your products with translation tools. Tax and VAT settings are provided depending on where you live. Coupons, discounts and affiliate settings are ready right out of the box. Stock tracking gives you alerts when you are running out of products. You can limit products per order. 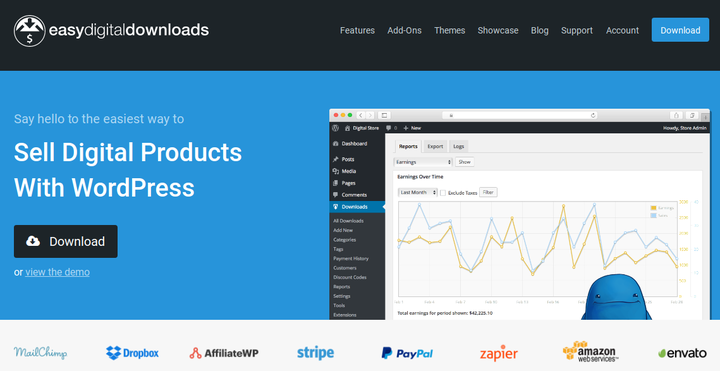 The primary product from WP eCommerce is a free download directly from its website. However, you do have the option to pay for the Gold Cart, which starts at $99 for a single site. Most of the add-ons are also sold on the website. 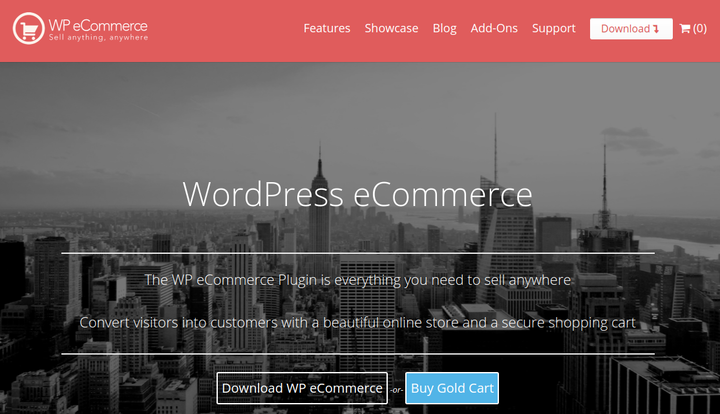 The main reason we enjoy the WP eCommerce plugin is because it looks so darn beautiful. Both free and paid payment gateways are provided as options, keeping your payments secure at all times. The multiple tax options are great for setting tax classes, exclusions and more. The reports API is completely open for those who would like to get additional data from their site. Automated marketing tools include product suggestions, social sharing, surveys and a Facebook Like button. The coupon management lets you reward loyal customers with certain metrics. Shopp isn’t my favorite when it comes to the frontend interface, but the secure checkout and flexible eCommerce development toolkit are enough to sell me on it. Basically, I like it best for those who are worried that other plugins are going to cause problems when it comes to scaling up. However, you’ll need some technical knowledge to work with this toolkit. An expansive development toolkit for creating just about anything you want on your website. The Shopp plugin has a solid support community for solving all of your problems. The cart management module has tools and settings for promotional codes, shipping and tax estimates and related products. The custom categories and search engine help out when guiding people throughout your website. Choose from grid and list views, depending on what you would like your website to look like. Shopp is probably the closest thing you can get to Magento as a free WordPress plugin, meaning that you get tons of features, but it’s more complex than other plugins on this list. The iThemes Exchange plugin boasts that it allows for users to get their products online within five minutes. This is definitely true, since the plugin is so easy to work with. However, I’ve found that you generally end up paying more money with this theme, since the add-ons are solid and some of them should be included in the free version. Another problem is that you can only get paid through PayPal or Stripe. Most people are fine with this, but it limits your options. It’s undeniable that the interface is very simple. Sell digital and physical products and manage all of the sales and customers from the dashboard. Memberships are available, but you have to pay for an add-on. Here’s the first plugin we’ll cover that isn’t a full eCommerce platform. 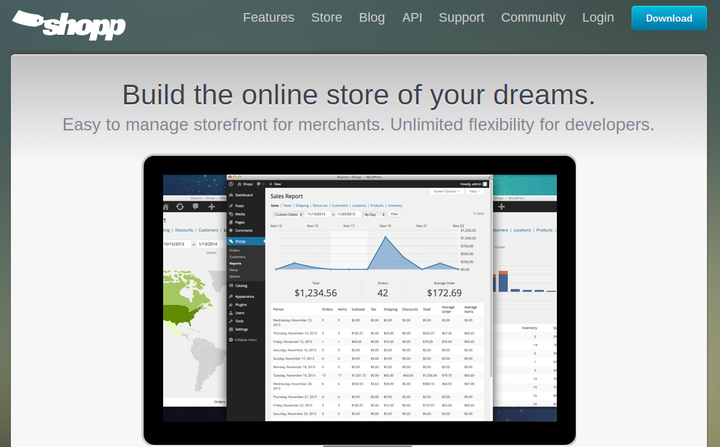 However, it’s useful as an extension to something like WooCommerce. You could also use it as a standalone product if you have a blog, magazine or learning website that you’d like to sell memberships for. Companies that sell direct-to-customer boxes or products will find this interesting as well. Choose from unlimited levels with recurring payment, protected content and member management. Paid Memberships Pro restricts access to anything from forums to simple blog posts. Several add-ons are provided for extending the plugin. It integrates with tools like MailChimp, Social Login, KISSMetrics, Infusionsoft, and WP Courseware. The plugin combines well with all of the popular payment gateways. The WooCommerce Menu Cart seems strange, but it’s often needed if your current WooCommerce theme doesn’t have the ability to show a shopping cart in the right hand corner of the header. We also like this plugin for those who converted a previously non-eCommerce website with WooCommerce. The WooCommerce plugin doesn’t have this built into the design, so WooCommerce Menu Cart is essential for keeping customers at ease about how much they’re spending, while also reminding them about the cart. Works with WooCommerce, WP-Ecommerce, EDD, Eshop and Jigoshop. Choose from different variations of what you want to display. For example, you could have a cart icon, products in the cart and the full price. Customize your own CSS from the backend. Choose to float the shopping cart icon towards different sides of the menu bar. A Pro Version is also sold if you’d like to expand on the base features. The Smart Manager for WooCommerce & WPeC plugin offers an incredible store admin interface with over 200 features. This plugin does nothing to your frontend, but it turns the backend into a well-oiled machine. The spreadsheet-like browsing cuts out wait times and allows you to see all of your data in one spot. Delete and manage multiple products and orders all in one click. Edit up to three products, orders and customers at once. Use the instant search to locate anything from products to customers. If you’ve been to sites like Etsy and ThemeForest, you’ve used a multi-vendor website. These welcome multiple vendors who open their own little shops on your store. If a buyer selects items from different vendors, they only have to go through one checkout process, then the revenues are divided properly between the vendors. The WC Vendors plugin gives you that functionality. A Pro version is provided, but the free one is pretty darn good. Instantly pay vendors the right amount once an order is made. Let vendors setup their own stores and profiles. Live sales information and product details are all managed on the backend. Vendors can comment on orders and talk with customers. Promotional tools are provided, and tons of shortcodes are given. Although this plugin may seem like something out of the early 2000s, it’s still an essential part of the eCommerce world. Sometimes all you want is a quick PayPal Buy Now button, and that’s what this one delivers. Supports 18 languages and 25 currencies. Four different button designs are offered. Change around the successful and canceled payment URLs. There you have it! If you’re thinking of making an eCommerce website, but would like to save some cash, the best free eCommerce WordPress plugins are right up your alley. Drop a line in the comments below if you have any questions.